Gaylord C. Lyon, Jr., graduated from the University of Virginia in Charlottesville with a B.S. degree in Economics. 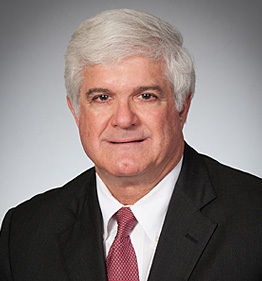 He began his insurance career in 1973, joining his father at Gaylord Lyon and Co. In 1986, the company merged with the Fry Zelnicker Agency to form the present insurance agency of Lyon Fry Cadden. Gaylord’s areas of expertise include healthcare, non-profits, surety, construction, real estate, and professional liability. In 1981, Gaylord received the Chartered Property and Casualty designation (CPCU) from the American Institute of Property and Liability Underwriters. As an active participant in the community, he has served on the boards of St. Paul’s Episcopal School, Southtrust and Wells Fargo banks, Alta Pointe Health Systems, Mobile Chamber of Commerce, YMCA, Volunteer Mobile and the vestry of St. Paul’s Episcopal Church. Gaylord is a past president of the board of directors of both Alta Pointe Health Systems, Mobile Association of Independent Insurance Agents and Mobile County Wildlife Association. An avid hunter and fisherman, he also relishes family time with his wife, Janet, and four children and their families at Dauphin Island.